This year we’ve been incorporating more and more fruits and veggies into our diets. I’ve been making lots of smoothies everyday, eating salads for every lunch and making pretty veggie filled dinners like this one at night. 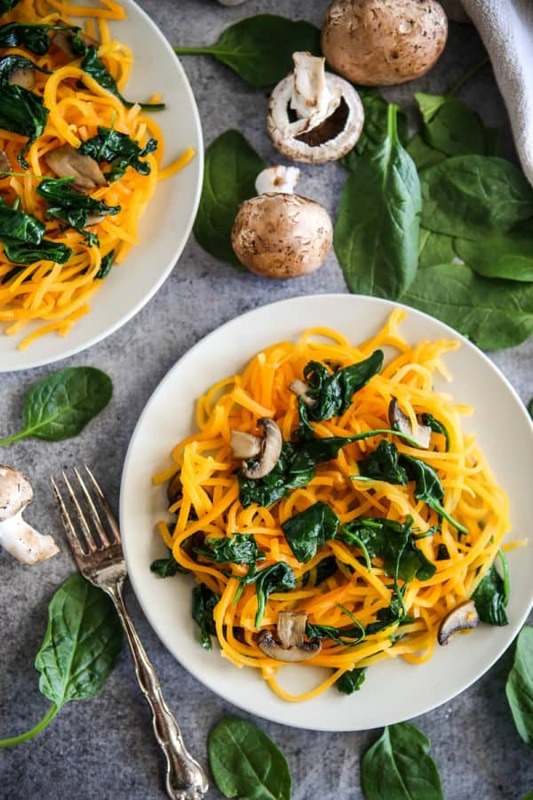 I’ve been obsessed with spiral veggies lately, but have been hesitant to buy a spiralizer. I am completely against unitasker kitchen utensils. I have enough clutter int he kitchen as it is! But then I found Green Giant® Veggie Spirals™ at Walmart. These veggies are already spiraled, and fresh from the freezer! Talk about one amazing convince item! 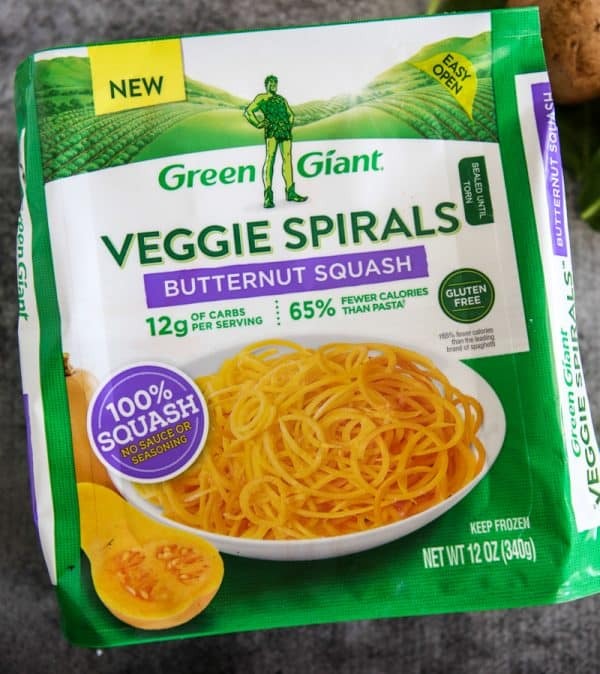 Green Giant® Veggie Spirals come in four amazing varieties: Butternut Squash, Carrot, Zucchini and Beets. There’s so many recipes you can make with these as a base. 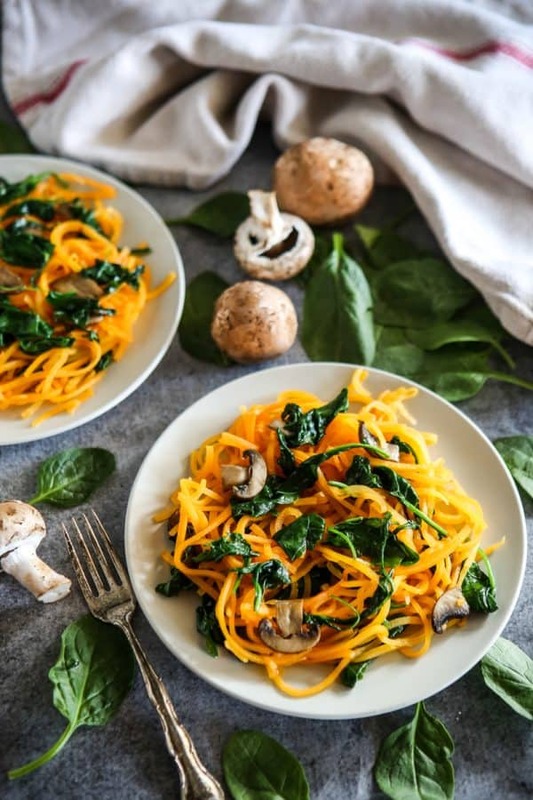 Forget traditional pasta, because there’s a new noodle in town! This is a super simple recipe with just a few ingredients. 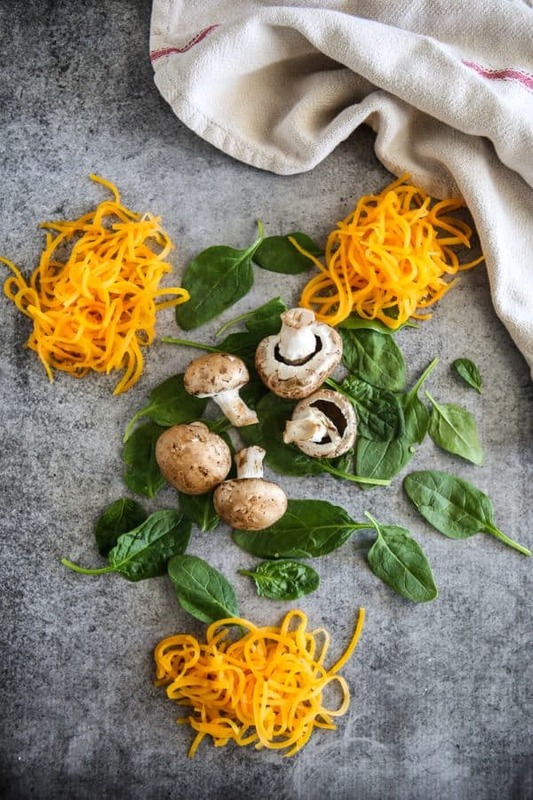 I start with the Green Giant® Veggie Spirals in Butternut Squash, fresh spinach garlic and fresh mushrooms. 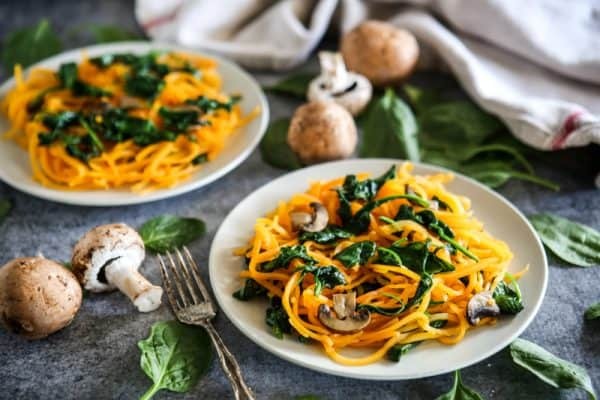 I sauté the garlic, mushrooms and spinach in a little olive oil and then toss it with the butternut squash noodles that I’ve prepared according to package directions in the microwave. I can’t wait to try the zucchini noodles in a simple Greek pasta with feta, red onions, green peppers, olives, cherry tomatoes and banana peppers. Oh my! The carrot spirals would be perfect in a Asian inspired side dish with a little sesame oil, green peas, green onions and sesame seeds. The beets would be perfect with some reduced balsamic, garlic, goat cheese and arugula. Yummy! You can use these Green Giant® Veggie Spirals in lots of different noodle recipes you already make. Just swap out the pasta you usually use for Green Giant® Veggie Spirals. They are gluten free and come without sauce or seasoning so you can prepare them just the way you like them! 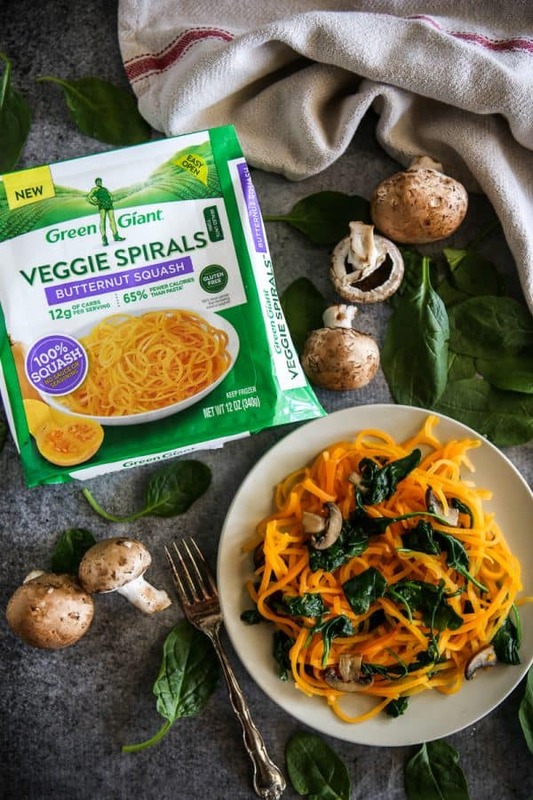 And the best part is, if you’re watching your weight like me, Green Giant® Veggie Spirals have 90% fewer calories than pasta*, making them the perfect better for you swap-in! They make an amazing entrée, a side dish, or soup. Green Giant® Veggie Spirals are simple to cook too! Just cook according to package directions in the microwave. Then remember to drain well just like pasta! Be sure to visit the Green Giant® Veggie Spirals website for coupons, recipes, and other offers. You can find Green Giant Veggie Spirals at your local Walmart. Be sure to also connect with Green Giant on their Facebook Page, Green Giant Twitter, Green Giant Instagram and the Green Giant Pinterest Page. Cook the Green Giant Veggie Spirals™ Zucchini according to the package directions, drain well and keep warm. Heat a medium nonstick skillet over medium heat. Add olive oil, garlic and mushrooms, cook until soft. Add spinach and cook until wilted. 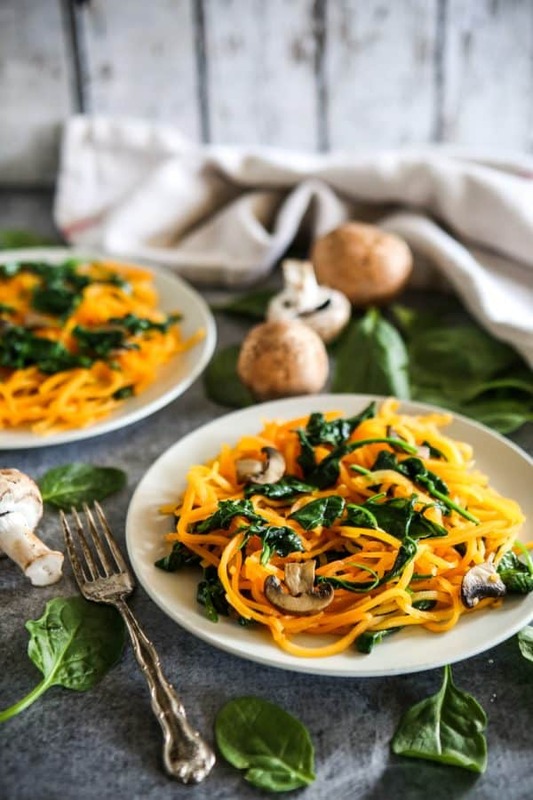 Add the well-drained butternut squash spirals and toss all the ingredients together until combined. Place on a serving dish. Serve hot. Serving Suggestion: Add grated Parmesan and sliced grilled chicken for protein. Tip: When cooking Green Giant® Veggie Spirals Zucchini, always drain well. Use paper towels to pat dry and soak excess water. I’m loving these spirals. I’ve tried the carrot & zucchini.